This past December, Michael Whitfield retired from his position as Executive Director of the Heart of the Rockies Initiative to pursue other opportunities, including a return to fieldwork and research that has long been a passion. At this juncture in his career, we asked Michael to reflect on his many decades of work, what his experiences have taught him about conservation, and where he sees the future of landscape conservation. We welcome reflections on these questions from all within the landscape conservation community. To start the conversation, here is what Michael shared with us. I found it fascinating, indeed inspiring, to hear all the shared perspectives on landscape conservation in last November’s National Forum on Large Landscapes. At other times I was reminded of the parable of a team of immobile blind men charged with describing an elephant–‘snake like’, ‘a pillar’, ‘a wall’, ‘a brush.’ The emergence of landscape conservation as an increasingly prevalent approach that I’ve witnessed in my career is both exciting and heartening, but I also sense that a complete perspective on what this means continues to be elusive. In my 48 years (to date) of engagement in various conservation endeavors – agency representative, environmental advocate, ecological researcher, educator, and community collaborator – I have often lived the errors of an incomplete conservation perspective. I have helped develop policy and write conservation plans that never made it to the ground, participated in ‘landscape collaborations’ that included only state and federal agencies, won conservation campaigns that alienated potential partners, advanced science that informed symposia but failed to reach conservation practitioners, shared ideas with like-minded people while missing opportunities to speak with a broader community. I have gradually learned the value of a more holistic approach. In short, I believe that landscape conservation fundamentally must be grounded both in appreciation for the needs of wild nature and natural systems and in respect for the individual dignity of people in all sectors. With such a holistic perspective guiding the landscape conservation approach, I contend that we as conservation practitioners must very intentionally develop the skills needed to engage all sectors of local communities if we are to achieve big picture conservation results. Further, to successfully engage whole communities will require us to incorporate both social and cultural goals along with ecological targets into our planning if we are to conserve nature in the face of today’s unprecedented challenges. Over my nearly five decades of work, I have come to believe that substantive and durable conservation success arises when community members from many backgrounds come together from day one to shape a common sense of place and develop a future vision grounded in respect for diversity of perspective. Success starts by building a foundation of mutual trust, trust that each participant’s values will be heard and respected. Such trust is the foundation for creating an open-source arena for dialogue and information exchange – a place where we work together in true collaboration to find common ground, a safe place where participants can change their perspectives, a platform that purposefully fosters a continual re-earning of mutual trust. I’ve found the power of such settings is that participants come to recognize that we are all stakeholders who wish to maintain and enjoy healthy, sustainable environments. Broad partnerships built on trust become platforms where landowners and community leaders have an active voice and where agency representatives and environmental advocates are welcomed, not as outsiders but as community members. Together we can visualize desired future conditions and recognize tradeoffs through provision of the best available science while always recognizing that the science informs decisions—it does not make the decisions—we as collaborative stakeholders do. Truly working together with the full array of stakeholders forces us to recognize that our collaborative efforts must respond to nature, resources, and people. We must form our vision around the most prominent social, cultural and ecological features of the landscape. As conservation practitioners we clearly have no chance at success if we merely offer the latest ecological information and hope for good decisions. Our goals must not only be ecological but must also consider “people” values: families, economy, culture, and legacy. In my landscape I am reminded of the simple lessons provided by a rancher in Montana’s Madison Valley. 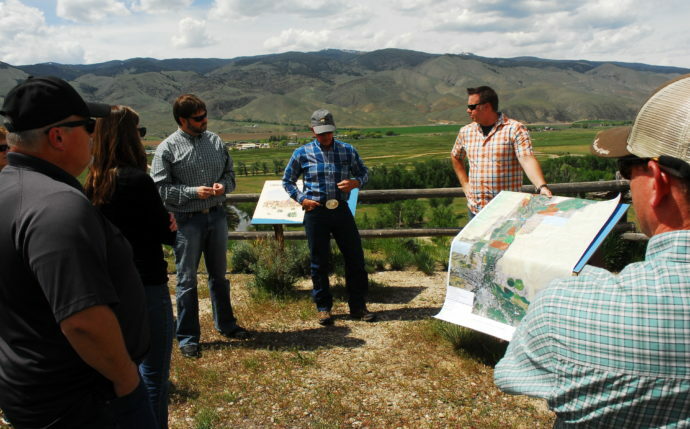 As he recognized the conservation successes achieved in his valley, he reminded us that if we are to sustain long distance seasonal elk and antelope migrations, we must also consider how we will sustain the private land forage upon which the wildlife – and the local ranchers – depend. Similarly, if we are to restore and sustain dispersal linkages for large carnivores such as grizzly bears, we must discover strategies to ensure tolerance for the inevitable conflicts. The full array of stakeholders should be invited to the discussion from day one (or as soon as we identify them). From there we will have to invest in our collective capacity to allow all sectors to continue to participate. We start by building trust that diverse values and perspectives will be respected, that we will work together to discover common ground. We need to work across boundaries in an All Lands and All Hands approach. We need to develop and share science at appropriate scales that allow practitioners to define what conditions will be if we choose one vision over another, to help us understand the advantages or disadvantages of conservation strategies. We rely upon our investment in one another and our shared stewardship of nature to make the right choices for the landscape. Our goals will necessarily be holistic: social, cultural and ecological. We must stay the course; true collaboration is a long iterative process. We must nurture the collaborative. Results matter—small successes keep people at the table. We should celebrate success. We have a much better chance of succeeding if we worry less about Who authored the success and more about Who gets to share in the outcomes. My viewpoints were formed in the big open of the American west. My enduring passion is for the protection of wild nature, wild nature on the big scales necessary for ecosystem conservation. It is never easy to reconcile my enthusiasm for the wild side of my home landscape with the realities of partnership with many individuals who, at least on the surface, have very different values. At the same time I greatly respect the perspectives of the landowners and community leaders with whom I share this landscape. Over time, I have learned that when we spend the time to understand one another, we discover that we generally share core conservation values. I also recognize that my enthusiasm will never be sufficient for conservation of my landscape. It will require a broadly collective love of home and shared conservation interest to get the job done. Today we face far greater challenges than a lack of good science or inadequate conservation funding. Too few of our neighbors are aware of or care about the needs of nature. Fewer and fewer of our people recognize the importance of connection to nature in their own lives, or understand the importance of healthy natural systems for their social well-being. Too many of our people struggle with day-to-day needs for food and shelter, let alone consideration for conservation of the broader landscape. In our current time we have allowed our diversity of perspectives and needs to divide us rather than enrich our work together. We need more bridges and fewer barriers. True conservation collaboration that is broad in participation and comprehensive in goal setting can build those bridges. And it is a critical time for building those bridges not just in our stewardship of our natural landscapes but also in our stewardship of our society. I believe that we as conservationists hold the keys to environmental and social renewal. At our core, we can feel the power of local community-based conservation when we experience it in action. No individual or organization or agency can meet all the challenges that we face alone, nor even can these challenges be tidily classified as “social” or “economic” or “environmental.” When we bring diverse perspectives together around a shared interest in sustaining a place that we call home, we can direct that power of community for tremendous benefit to nature and community at large regional scales. We succeed together. How investing in ‘backbone leadership’ is paying off in the Gulf of Mexico region: From oil spill restoration to community resilience.